Financial advisers, it would seem, just want the UK to get on with Brexit. These are the findings of Money Marketing’s latest survey, in which we questioned nearly 400 advisers up and down the country about their view on the most significant political change the UK has seen for decades. Despite the group leaning toward the remain camp – nearly 60 per cent of advisers expressed this view – almost half (49 per cent) say they do not want a second referendum. 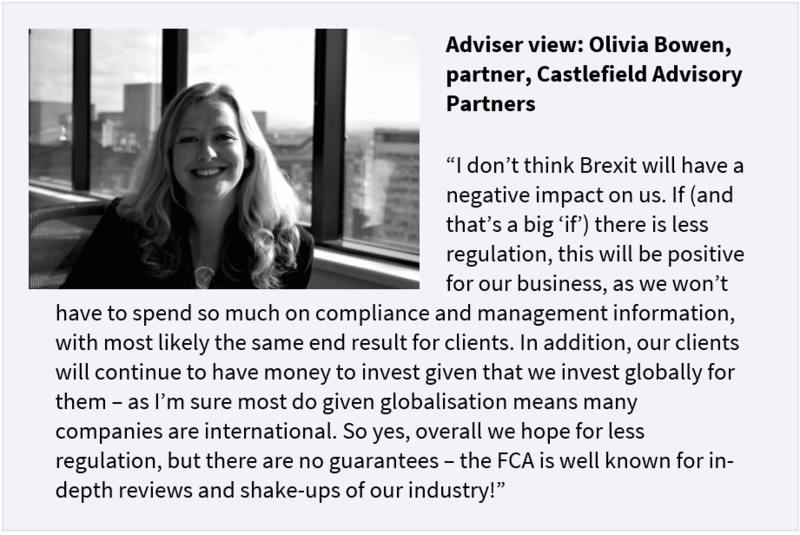 However, worries about the impact the UK leaving the European Union could have on advisory practices do persist, with continued uncertainty around trade and regulation weighing heavily on advisers’ minds. The perceived intransigence of EU negotiators is hardening opinion, as is negative rhetoric and infighting among UK politicians. Financial advisers, like many other people living the UK, are now looking hard for the light at the end of the Eurotunnel. One of the most important aspects of Brexit is the effect it could have on UK employers and jobs. For advisers, this impact has, to date, been neutral. Nearly 70 per cent of advisers told us that, so far, the UK’s impending exit from the EU has not impacted their jobs, while two thirds (63 per cent) told us their companies and employers are also unaffected. Moreover, around 45 per cent believe they will be unaffected after Brexit. While some might see this as complacency, according to Pimfa deputy chief executive John Barrass, this is, in fact, a fair assessment. However, for those that have seen a Brexit effect, more advisers do report negative consequences than positive, with nearly one fifth stating that Brexit has already had a slight or strongly negative effect on their jobs and employers (versus around 13 per cent reporting positive impacts). Furthermore, more than 40 per cent of advisers say their companies would be hurt by a messy EU divorce. One chief concern for advisers is how Brexit might hurt UK savers’ personal finances – something we are already seeing evidence of in rising inflation as a result of a weaker post-referendum pound. Another area of concern is the wider financial market, which many agree is likely to dip on Brexit – especially if negotiations fail – and the impact this will have on client portfolios. As is clear from the above, most advisers would like to see a smooth and amicable divorce from the EU, with as much of the current arrangement maintained as possible. More than half of those surveyed say they want the UK to stay in the single market, and that they support a transition period of at least two years. Despite this, though, a surprising number of advisers (47 per cent) believe that no deal is better than a bad deal. Courtiers Asset Management chief investment officer Gary Reynolds puts this seeming contradiction down to a lack of foresight. However, on the no-deal scenario, Reynolds agrees, pointing to pro-Brexit economist Patrick Mimford, who argues that the EU is not a free trade area as you must be a member to qualify, and that the UK would benefit by leaving and then opening up tariff-free trade to the world. Perhaps unlike the majority of respondents to the survey, both Reynolds and Barrett underline a view that sees free trade with the EU as a red herring in both the pre- and post-referendum debate. "Brexit is one of the major concerns overhanging markets at the moment – if we crash out with no deal, a lot of markets will go south very fast while we work out what the hell is going on"
Instead, what may be at the heart of this contradiction in adviser views – that being a strong desire for free trade and single market membership while preferring a ‘no deal’ scenario – may be a hardening of opinion against the EU. 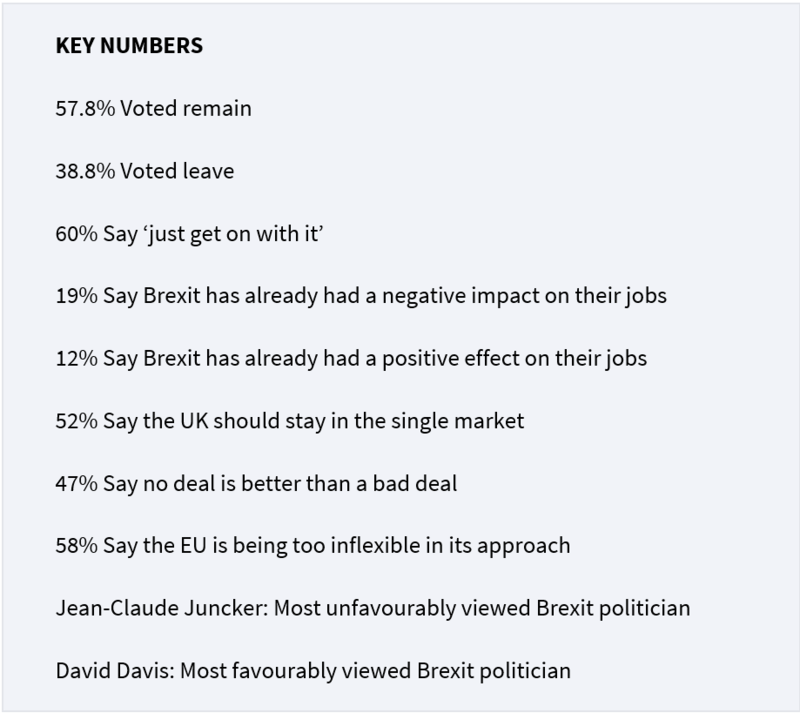 This is suggested by the nearly 60 per cent of survey respondents who state they believe the EU is being too inflexible in its approach – one of the strongest ‘agree’ answers overall. Moreover, in terms of disapproval ratings, president of the EU commission Jean-Claude Juncker leads, with two thirds of those surveyed viewing Juncker more unfavourably than any other Brexit politician. 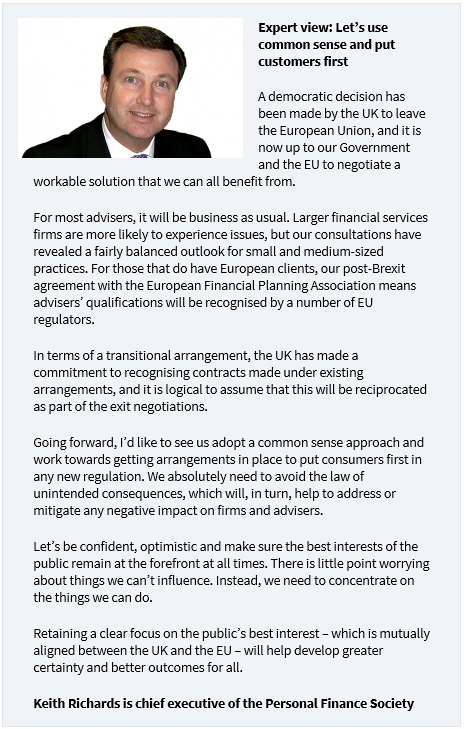 This attitude is further underlined by an increase in the number of advisers that would vote leave in a fresh referendum – up from 40 per cent in June 2016 to 42 per cent today. Others, however, believe that current expectations of the EU are unrealistic. Cockerill agrees, adding that too much emphasis has been placed on the importance of our market to the EU. One area where advisers are united, however, is in their desire to see a more positive rhetoric from Westminster and businesses from here on. Combined with the 60 per cent who simply want the Government to get on with Brexit, an equal number of advisers believe it is the Government’s ‘duty’ to implement it. Now that it seems the UK is firmly heading for the door, it is time to talk up the opportunities. As perhaps already indicated, an open and welcoming attitude to global trade is a hallmark of this debate. More than 60 per cent of advisers agree that the ability to sign trade deals with non-EU countries is ‘very important’ now – the strongest affirmative answer overall. Regulation is another area of aspiration, as highlighted by numerous survey respondents. Unlike Cockerill, others also believe that the market upheaval potentially caused by Brexit could create advice opportunities, with caution driving clients towards professionals, while others merely look forward to the stock picking opportunities in such a market. Thus, it would seem that, despite fears over how Brexit might impact businesses and clients, the UK’s financial advisers are ready for the country to start extricating itself from the EU. As ever, clarity and certainty are desirable – as are current arrangements around trade, and a grace period in which Britain’s economy, legal and financial systems can adjust to their newfound independence. As some have argued, this may be a little too wishful. Regardless, though, the message is clear: keep calm, and Brexit on.